Be the first to book this renovated gulf front condo at Tops'l Beach Manor! Enjoy these one of a kind views of the Gulf and Tops'l Hill Nature Preserve! This is a great getaway for a weekend or a week with family and friends. Enjoy the views while cooking in this fully renovated kitchen. The master bedroom is nicely appointed with its own views as well as a king bed and flat screen television. The spare bedroom has a comfy queen bed with a flat screen as well. Come enjoy some quiet time at Tops'l Beach Manor! 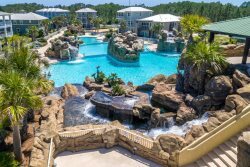 5 miles to the Largest Designer Outlet Mall in the South, Silversands, Destin Commons too many to list Golf Courses. Hilton Hotel next door, Baytown, Sandestin. Add $150 for housekeeping and 11% for tax. There is a $69 damage protection fee, $30 booking fee, and 2.2% fee to process credit card payments. A deposit of 25% holds the unit for you and is applied toward your final payment.